IGE signs MOU with Uzbekistan's Institute of Strategic and Regional Studies and the Institute for Monitoring the Formation of Civil Society. 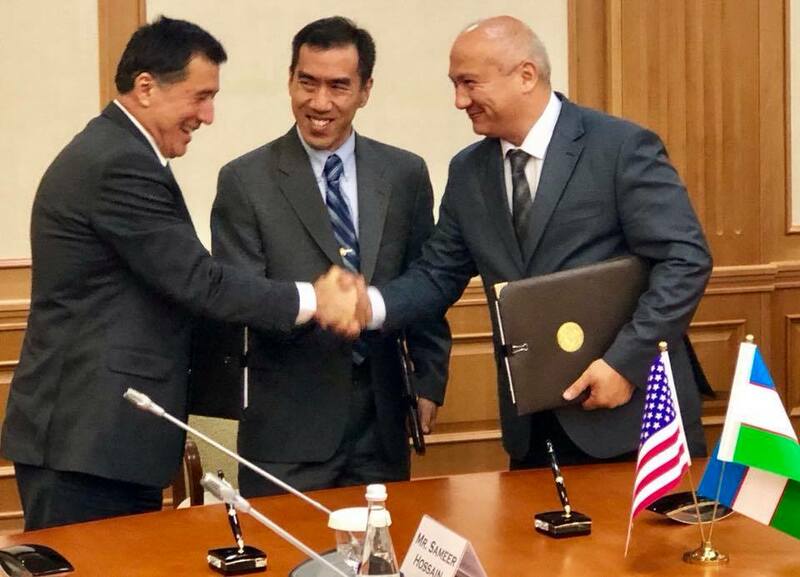 On September 17, 2018, the Institute for Global Engagement (IGE) and the Uzbekistan government signed a Memorandum of Understanding (MOU) to partner together in efforts to build religious freedom in the country. The government was represented by the Institute of Strategic and Regional Studies under the President of the Republic of Uzbekistan (ISRS) and the Independent Institute for Monitoring the Formation of Civil Society (NIMFOGO). The signing ceremony was witnessed by U.S. Ambassador-at-Large for International Religious Freedom Sam Brownback and U.S. Ambassador to Uzbekistan Pamela Spratlen, as well as officials from the U.S. and Uzbekistan governments and representatives from Uzbekistan’s religious communities. The groundbreaking MOU marks the first time that Uzbekistan will work with a foreign NGO to address religious freedom. Uzbekistan has been designated as a “country of particular concern” (CPC) since 2006 by the State Department’s annual International Religious Freedom report. However, since a major leadership transition in 2016, Uzbekistan President Shavkat Mirziyoyev has carried out major economic and political reforms that have attracted widespread attention and affirmation from both Uzbek citizens and the international community. The government has also signaled strong willingness to improve Uzbekistan’s religious freedom situation. In addition to the MOU signing, IGE led a delegation of American Christian and Muslim leaders to meet with counterparts in Uzbekistan. The IGE delegation consisted of James Chen (Executive Director of IGE), Rashid Dar (Program Officer at the John Tempeton Foundation), Sherman Jackson (King Faisal Chair in Islamic Thought and Culture at University of Southern California), Wade Kusack (President of LYN Community), Bob Roberts (Pastor of Northwood Church in Dallas, TX), Chris Seiple (President Emeritus of IGE), Talib Shareef (Imam of The Nations Mosque in Washington, DC), Jeremy Weber (Deputy Managing Editor of Christianity Today), and James Wellman (Professor and Chair of the Comparative Religion Program in the Jackson School of International Studies at the University of Washington). The IGE delegation met with leaders from Tashkent’s Muslim, Protestant, and Catholic communities to learn more about their situation on the ground. At the invitation of the International Islamic Academy of Uzbekistan, the delegation gave presentations and interacted with students and faculty. The delegation also visited Samarkand, one of the oldest cities in Central Asia and a vital part of the ancient Silk Road, to learn more about the central role that Uzbekistan has played in Islamic civilizational history. Looking ahead, IGE and its Uzbek partners discussed various possible activities for the near future including creating multi-faith roundtables, holding certificate training programs on cross-cultural religious literacy, and a convening a conference on the positive role of religion. Left: The MOU signing was observed by Ambassador-at-large for International Religious Freedom Sam Brownback and Uzbekistan's Senate Foreign Relations Committee chairman Sodyq Safoev. Right: Members of the IGE Delegation and U.S. Ambassador to Uzbekistan Pamela Spratlen.